Then Jeb went all existential, delving into his Freudian father issues: “I totally get it … because I have a brother that was president and a father that was president. And that higher expectation was important to realize. 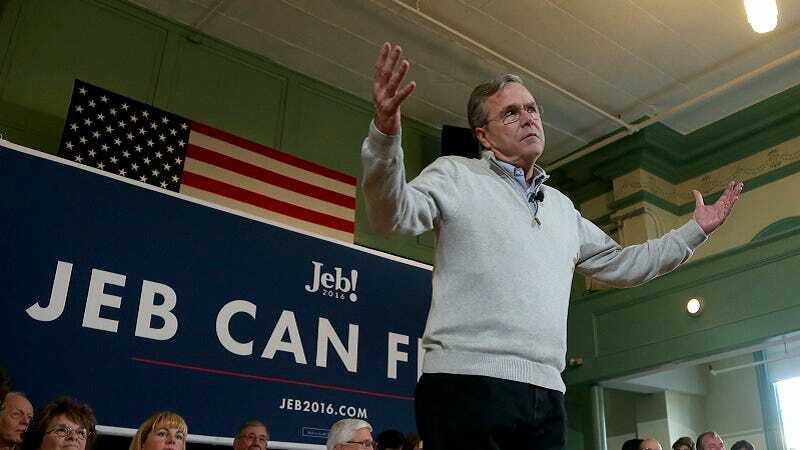 And so, being the frontrunner made me feel like the other guys [were] just dancing right through this.” But there’s no need to worry about sad Jeb Bush, he’s perfectly resigned to his destiny, “I feel good about where we are right now,” he said. Apparently, sad rich guy is the hottest trend in losing a campaign. But, in the meantime, Bush is awkwardly going through the motions of campaigning, a treat for all of us. In a New Hampshire stop, Bush tried to fend off Trump’s labelling of him as “low energy.” “Donald Trump is a jerk,” Bush told the crowd. “I gave myself therapy there,” he added. Then he looked into the distance and fondly recalled the days when he—Jeb, governor of the worst state in America—was the favored son.